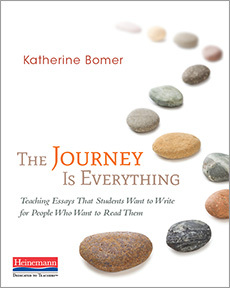 Katherine Bomer’s latest book, The Journey is Everything: Teaching Essays that Students Want to Write for People Who Want to Read Them (2016) argues for teaching essay as literature, with shapes that arise organically from content, not from formulas that shut down thinking. Her book, Hidden Gems: Naming and Teaching from the Brilliance in Every Student’s Writing (2010) and accompanying DVD, “Starting with what Students Do Best” offer a transformative new approach to assessing and responding to student writing, even the most spare or difficult to understand. She also authored Writing a Life: Teaching Memoir to Sharpen Insight, Shape Meaning, and Triumph Over Tests (2005), and For a Better World: Reading and Writing for Social Action, with Randy Bomer. Katherine currently teaches the “Writing Process and Pedagogy” course in the Graduate program in the University of Texas at Austin. She has taught primary and intermediate grades, and her classrooms have been featured in Annenberg video productions. She worked as a professional developer at the Teachers College Reading and Writing Project with Lucy Calkins, and currently consults nationally and internationally, presenting workshops in school districts as well as demonstrating and coaching inside K-12 classrooms about approaches to teaching reading and writing across the curriculum. Schools invite her to coach them in creating visions for their year-long curriculum in reading and writing, and to help them form teacher and administrator study groups to continue their learning. As a frequent and popular keynote speaker, she combines a teacher’s practical advice, a writer’s love of language, and a powerful plea for social justice. Even though I haven’t been in touch with you for so many years, I think about you a lot, and you inspire my teaching. I’m trying something new with personal essay, and I was wondering if I could share my thoughts and a sample or two of student writing with you.